What are some phrases or ‘proverbs’ that you grew up hearing? We are reading through the Bible together, trying to learn how God and His Story shapes our everyday life. This month we are reading through the Wisdom literature: Proverbs, Ecclesiastes, and Job. And I was taught that, when you read a book, you should always find the author’s purpose statement and/or thesis statement. Most books in the Bible don’t give us that but Proverbs—like Luke or Acts—does. So what is the purpose of the book of Proverbs? The purpose of Proverbs is to teach us to be wise. 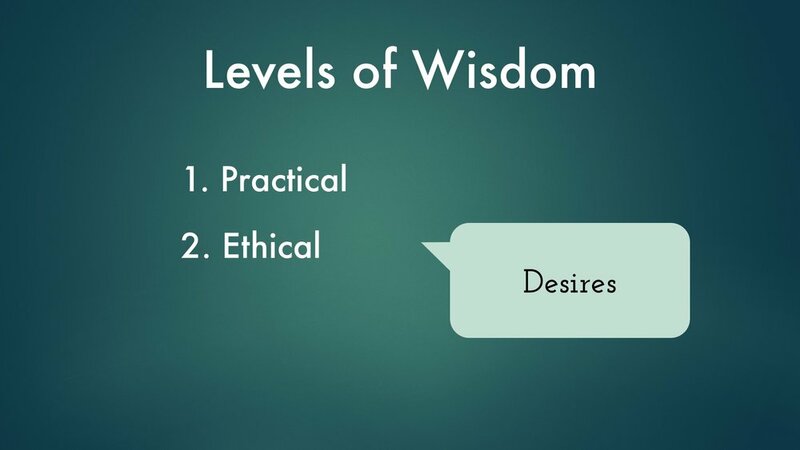 Proverbs presents three ‘levels’ of wisdom. The first is the Practical level, which reveals and directs our Choices (What we do with our Thoughts, Emotions, Actions). We read this in Proverbs 1:4 – “to give prudence to the simple, knowledge and discretion to the youth—"
Discretion is the ability to make choices that keep you out of trouble or knowing how to deal with trouble when you are already in it. A lot of this is what many of us would call emotional intelligence: to see and be aware of what is going on around us/outside of us. Proverbs covers a lot of practical issues: communication, relationships, aging, business, emotions, vices, marriage…the list goes on. In 2014, Volkswagen publicly announced that they wanted to be the world’s largest automaker. To do that, they new they would have to grow in certain niches, one of which was clean diesel. They wanted to be able to advertise that their cars to have lower emissions than the others. And they did. Successfully. But their diesel cars were emitting 40 times the allowed level (U.S.) of nitrogen oxides. And, as we now know, instead of fixing the problem in the cars, they deliberately falsified emissions tests by installing a software in the cars that made them appear to test better than they actually did. And that helped get them to the number one car company in the world. Sort of. Proverbs would say that the folks at Volkswagen are not wise people – and not because they got caught. To be a wise person in Proverbs is to be a righteous person. Doing what is right, just and fair. Proverbs is not just about good living but being a good person. If you achieve success at the expense of others, you are not a wise person. The trap we tend to fall into is to stop at the first or sometimes the second level of Wisdom. We are often content with the idea of good living and being a good person. But he does not know that the dead are there, that her guests are in the depths of Sheol (Hades). This guy, Photo Temper Longman, an OT scholar who’s focus is on the wisdom literature, points out that the location of the woman’s houses reveals something about who these women are. Insert Photo/Graphic In Jerusalem and the ancient near east, only one house can be built on the highest point: the temple. This is the place these two women are claiming and, in so doing, they are claiming to be God. So Proverbs is telling us that Women Wisdom is God and Woman Folly is a false god. Therefore, according to Proverbs, the Fear of the Lord is recognizing that God and God alone has His house on the highest point, that He is King over the universe, the world, our cities, our neighborhoods, our families, and us. Fear of the Lord is not acknowledging that God exists or being afraid of Him – the demons do that much. The Fear of the Lord is recognizing what is most real: God and His Story. The third level—the Theological level—of Wisdom reveals and directs our Allegiance. And this is what Proverbs sets up for us in chapters 1-9. If the deepest level of Wisdom reveals and directs who we give our Allegiance to, who we place at the highest point of our lives, our church family, our city, etc., then as you read practical directives like Proverbs 22:6 “Train up a child in the way he should go;” there is something about that has to do with you as parents living into God’s Story. Or an ethical directive like Proverbs 14:31 “Whoever oppresses a poor man insults his Maker,” can’t be read just as “here’s how to be a good person” but here is something about being good that has something to do with us giving our Allegiance to God instead of a false deity. Wisdom is the skill of living into God’s story – for us that means living into God’s story in a broken world where other stories seem more real. In fact, the Hebrew word for wisdom: Hochma. Same word used in Exodus 31:1-11 when God describes the skill He has given Bezellel for shaping things into great beauty. Wisdom is the skill to see what is happening in me and others, discern the desires and affections that are at work behind what we see, and then begin to cultivate the Goodness and Wholeness of God’s Kingdom in the hear and now. But Wisdom is not a skill you can master, like learning to type. I have a neighbor who is a Master Gardener but he will tell you, he hasn’t mastered gardening. Even the book of Proverbs—who’s self-declared goal is to teach us to be wise—isn’t set up to show us how to master wisdom. We tend to look at Proverbs and Wisdom like a set of architectural blueprints when in reality it is more like an Impressionist painting. Wisdom is an artistic, imaginative skill that we are constantly developing. Wisdom comes from God, even James in his book tells us that if we lack wisdom to ask God for it. The Bible tells us that Solomon asked God for wisdom and God gave it to Him. But most of the time it doesn’t just come from God like a super power that we suddenly get by standing too close to a nuclear reactor. And, if you take Solomon’s example, even if it did happen to us that way, there is no assurance we would keep using it well. Proverbs 3:19 says that “The Lord by wisdom founded the earth;” so Wisdom is built into everything in Creation, including you and I. So if wisdom, the artistic, creative skill of living into God’s Kingdom, God’s Story, is embedded in us and all of Creation—trees, rivers, music, match, etc.—what two areas do you think wisdom is revealed and developed? In our everyday relationships and work. Here is our homework for this week. Because Proverbs argues that we need to develop the skill of wisdom because it is how we come to live in what is most real—God and His Kingdom—in our everyday roles and relationships. Jesus—who has gone before us—is our guarantee. He is who we listen to, He is who we look for, He is who we hope in. It is in Christ by His Holy Spirit that we grow in Wisdom and Fear of the Lord.